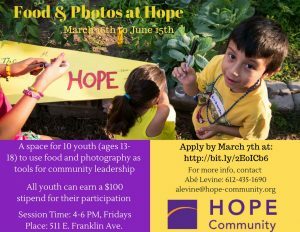 Hope’s youth-led program exploring food systems, place, and personal narrative through photography. The Food, Land, and Community team at Hope conducts year-round activities related to growing, harvesting, and sharing food. This project is an endeavor that puts youth in the center of their own food stories. Opportunities for both fun and learning abound. Field trips included a visit to Mia galleries, visiting a farm, and venturing to meet with other youth interested in food systems. The group was co-facilitated by Ryan Stopera, a professional photographer and videographer and Abé (uh-bee) Levine, a garden educator at Hope and writer. 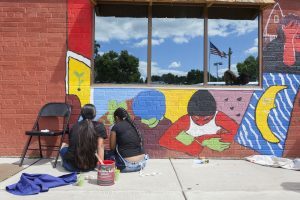 Minneapolis Institute of Art partnered with Hope Community on the Power of Vision Mural Program, working with a group of young people from the Whittier and Phillips neighborhoods to design and paint this mural. With the creative guidance of artists Olivia Levins Holden, Tori Hong, and Alizarin Menninga-Fong, the youth explored issues impacting them and their communities, and how they and others are working to heal people and the earth. They collaboratively designed and painted this image to make those stories visible on Franklin Ave.
Minneapolis Institute of Art partnered with Hope Community on the Power of Vision Mural Program, and in collaboration with St. Stephen’s Human Services, worked with artists Jordan Hamilton and Pacha Galaviz to explore issues impacting the lives of homeless and housed individuals. 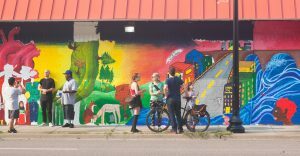 Contributors collaborated to design and paint this mural. These images make visible their stories of struggle, strength, vision, and connection. Located Near Nicolett Ae on 19th Street East in Steven’s Square Neighborhood. Hope Community, in partnership with the Minneapolis Institute of Art and St. Stephen’s Human Services, worked with artists Olivia Levins Holden and Jordan Hamilton to explore issues impacting the lives of homeless and housed individuals. Contributors collaborated to design and paint this mural. The images seen here make visible their stories of homelessness, hope, and transformation. As part of an ongoing collaboration between the two organizations, Mia and Centro brought together teens to identify and create a visual representation of pressing issues affecting their lives. Over the summer of 2016, the teens from Centro’s Raíces program worked with Hope Community, mural artists, Leilani Mendoza, and Andres Guzman to share their personal stories, challenges, and explore their roots together. 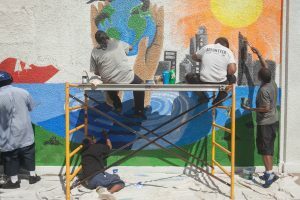 They took field trips to mural sites across the city to get ideas, visited the museum for inspiration, and spent time in the studios learning basic painting techniques. The result of many hours together, this summer’s mural on the wall of Centro Tyrone Guzman is the second in a series of two. Located on Chicago Avenue just north of East Franklin Avenue in Minneapolis. In 2015, this intergenerational project brought together a group of women and teens to identify pressing issues affecting their lives, and to create a visual representation of those. For the past three months, both groups worked with a facilitator and a mural artist to collect and share stories. They took field trips to mural sites across the city to get ideas, and visited the museum for inspiration and to learn basic painting techniques in the studios. 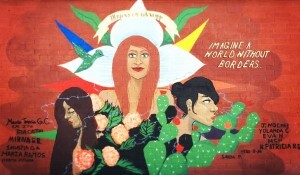 The first mural, located on Centro’s Chicago Avenue facade, was conceived of by the women’s group and contains imagery important to them, alongside a message of hope for the future: A woman’s face is turned to the right, looking towards a section of blank wall, which will be painted by the teens next summer. Mia’s Community Art Project is sponsored by The Friends of the Institute; teen programs are generously supported by Best Buy. 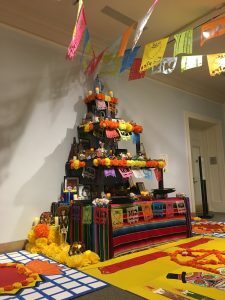 In partnership with Centro Tyrone Guzman, Mia presents a Día de los Muertos (Day of the Dead) altar by artist Monica Vega. Día de los Muertos is a cultural tradition from Mexico when families remember those who are no longer with us and, in doing so, keep their spirits alive. Community altars, such as this one, provide an opportunity for us all to connect with the rich historical and cultural roots of our ancestors. This particular altar is designed to incorporate the four Aztec elements of fire (candles), water (beverages), wind (cut paper), and earth (flowers). The summer of 2015, Mia exhibited the Institute For Figuring’s worldwide Crochet Coral Reef project as part of the special exhibition “Leonardo da Vinci, the Codex Leicester, and the Creative Mind,” on view June 21–Saturday, November 21, 2015. Reflecting on intersections between art and science, this exhibition is anchored by Leonardo’s famous Codex Leicester, the notebook in which the Renaissance master sketched his ideas about water both figuratively and conceptually. 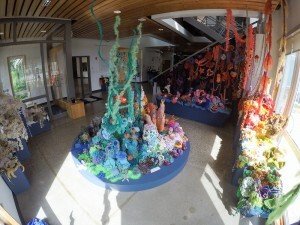 Organized by Mia and created by the community, the Minneapolis Satellite Reef was exhibited at the Mississippi Watershed Management Organization Community Facility (MWMO) August 24–November 21, 2015. Click here for a Mia: Of Us and Art video about the project. Click here for a MWMO video about the project.